One of my favorite types of foods to eat while dieting is Mexican. Heck, it's a favorite even when I'm not dieting! The bold flavors let me think I'm eating something bad, but if I use lean meats and lay off or cut back on the cheese and sour cream (not difficult for me), it can really be quite healthy. Especially if I use a low-sodium taco seasoning. A couple weekends ago, I made what I thought was a large batch of taco meat. For Joe and I, this would have been considered a large batch and would have left us with plenty of leftovers for later in the week. I forgot to consider that my eldest nephew was staying for dinner. Goodness! Twenty year old boys sure do eat a lot! Yes, I said "boy". I'm having a difficult time thinking of him all grown up. sigh. Anyway, there was a small amount of taco meat leftover that Joe took for lunch a day or two later. By the time the weekend rolled around, I was still very much in the mood for tacos, but all out of ground beef or turkey. I had some boneless chicken breast and decided to make some chicken taco salads for dinner. I really loved how this turned out and love even more how it fits perfectly with my new Simply Filling lifestyle. 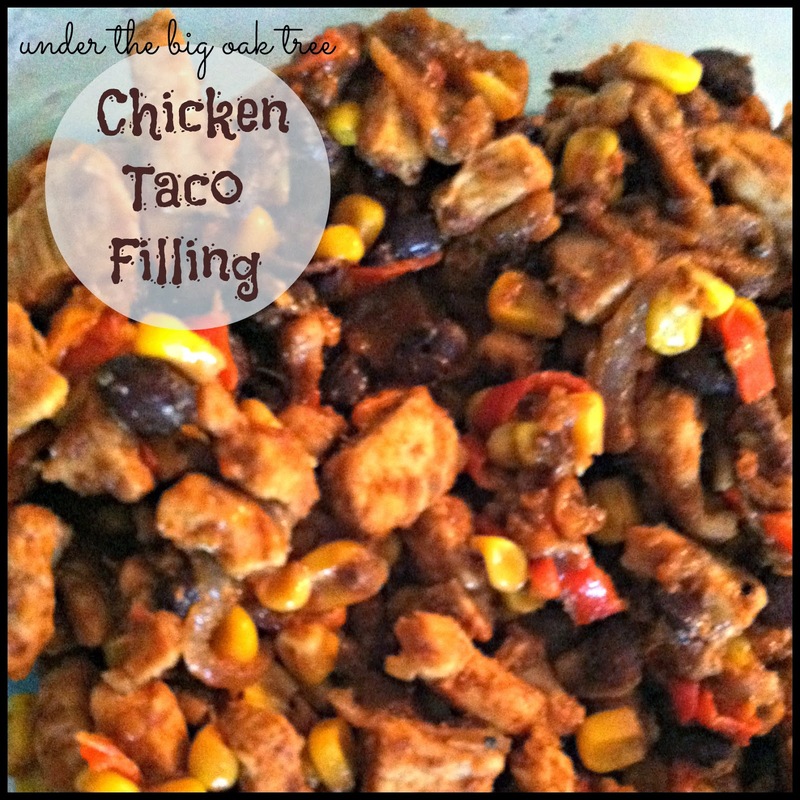 While I used some "indulgence" points for the taco shells, these salads would still be great without the shells if you wanted to keep this recipe completely Simply Filling. Be sure to count points for the oil if you've already used your daily healthy oils. 1 smaller vidalia onion, diced. Cook chicken in hot oil until no longer pink. Add in onions and peppers and cook until tender, stirring often. Stir in the garlic and corn. Allow to cook until corn is thawed. Pour in the beans, taco seasoning and water. Stir until fully combined. If you find the mixture getting a bit dry during the cooking process, instead of adding oil, add a splash or two of water as needed.